Many of Delticom’s B2B shops now offer a lifetime warranty on tires of the brands Star Performer, Goodride and Nankang. The warranty is valid in Germany, Austria, Switzerland, Netherlands, Sweden, Denmark, France, Spain, Italy, Poland, Portugal and Finland. Depending on the remaining tread depth, either the complete tire or the proportionate price will be refunded. 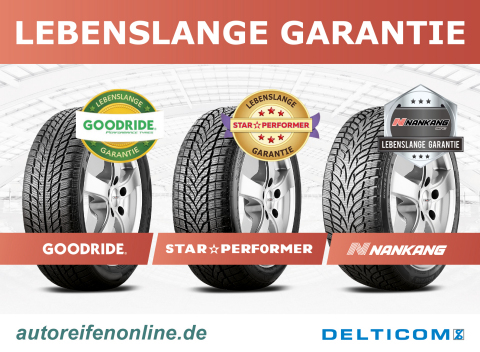 HANOVER, Germany--(BUSINESS WIRE)--Users of Goodride, Star Performer or Nankang tyres will be more relaxed when it comes to their wallets in the future: Many of Delticom’s B2B shops now offer a lifetime warranty on its Star Performer tires and other Delticom house brands - giving its dealers strong selling points. The warranty is valid in Germany, Austria, Switzerland, Netherlands, Sweden, Denmark, France, Spain, Italy, Poland, Portugal and Finland. In the event of manufacturing or material defects and even irreparable damage due to everyday use the tire will either be replaced at no cost or big discounts will be offered. The compensation claim depends on the remaining tread depth. For example, defective tires with a remaining tread depth of six millimeters or more will be replaced with new ones, or customers receive a discount of up to 80 percent of the current price on the day the warranty claim is made. Autoreifenonline.de is the exclusive German online shop for garages, dealers, wholesalers and service/installation stations from Delticom AG with tires of all types and car accessories. With more than 15 years experience in online tire business, the B2B professional team from Autoreifenonline.de offers their business customers an outstanding range of car and motorcycle tires of all makes and sizes for all vehicle types, light truck and truck tires, bus tires, special tires, complete wheels, car spare parts and accessories, engine oil and batteries. Dealers not only benefit from good purchasing conditions, but also time-saving tire search functions in the online shop, high availability, reliable delivery thanks to their own warehouses, as well as easy registration and use without any hidden costs - from the very first tire on. Online shops for dealers and garages in Germany, Austria and Switzerland: www.autoreifenonline.de, www.autoreifenonline.at, www.autoreifenonline.ch and 24 other countries.